7 top tips for taking care of the business side of freelance life. The relationship between creativity and commerce is a rocky one, and it's particularly rocky when you're a freelancer. For all its joys, being your own boss also means being your own accounting department and occasional bailiff. Freelancers face three key issues: staying on top of the paperwork, getting paid and ensuring the taxman doesn't chuck you in prison. Taking care of all that can eat into the time you'd rather spend on designing. So how do others do it? Elly Walton has been a freelance illustrator for over 10 years. Her client list reads like a who's who of the advertising, design and publishing fields, but despite her success, she's been using "pretty much the same old Excel spreadsheet with my incomings, outgoings and tax payable on it" all that time. Walton also records "the jobs as they come in, how I got them and whether it was a result of promotion or word of mouth," she explains. "It makes a nice, pretty graph that I look at occasionally to review my marketing." Walton uses an Adobe Photoshop template for invoices, prints hard copies – "I like to have a stack of physical paper to check through and stamp a little 'PAID' on it when it's paid" – and invoices jobs on completion. Procrastination, says Walton, is the enemy: "[Tax] isn't really that painful, but it's a hell of a lot more painful if you leave it until the deadline." If you're a sole trader in the UK you'll pay Income Tax on your profits (sales less expenses) as well as National Insurance contributions; limited companies pay Corporation Tax on business profits; and if you're turning over more than £85,000 per year (it happens!) there's quarterly VAT, too. It may be worth registering even if your turnover is less: under the Flat Rate Scheme someone in advertising can charge 20% but only pay 11%. Doing your own tax return isn't difficult, but if you're VAT registered or running a company you might want to consider hiring an accountant. It isn't too expensive and there's something enormously satisfying about handing over a shoebox full of receipts and never having to worry about it ever again. Like Elly Walton, beauty, fashion and portrait illustrator Willa Gebbie used a system based around a spreadsheet, in this case Google Docs, but in 2013 she decided to switch to FreeAgent. "That's when I finally got around to having a proper business account as well," she says. Until then she hadn't felt it was necessary, not least because business accounts come with a plethora of charges after the first year. "A normal account will do, as long as you keep your work money and personal money clearly separate," Gebbie says. 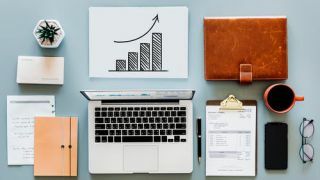 "As a sole trader, it's unlikely that you'll need the benefits (or costs) of a business account, so it's better saving those few pounds." Gebbie is a big fan of FreeAgent. "I love how it completes my tax return for me, it's truly a godsend," she says, adding that "it's really good at assigning bank payments to invoices automatically, so I can tell really quickly who has or hasn't paid." While FreeAgent can automatically notify clients of overdue invoices, Gebbie fears that it could look "spammy", so she prefers to do the chasing herself. "I write invoices as soon as I've finished the job," she says. "Once a week I check payments and chase outstanding invoices. If they're really late then I'll start to chase every couple of days." Award-winning hand-lettering artist and illustrator Linzie Hunter is another convert to online systems, in her case Wave. As a former "shoebox and Excel spreadsheet" user, Wave has freed up a lot of her time. "Having a cloud-based system means that I can keep track of payments and invoices easily wherever I am. My favourite feature is the ability to link it to your bank and PayPal accounts, so I no longer need to enter everything manually. It's also good at showing you exactly where you are financially." Tempting as it might be, one feature Wave and FreeAgent don't currently offer is the ability to send drone strikes after late payers. Walton is unusual – "I've been lucky not to have had a non-payer" – but stresses the value of clear payment terms. "30 days is reasonable," she says. "As soon as that date arrives, start chasing – as politely as possible, of course." Gebbie agrees. "Sometimes clients don't pay on time, but often that's because of the finance department rather than the art director… it's probably quite embarrassing for them." Going in all guns blazing is never a good idea, but if you're suffering from acute late payment or non-payment, then the Late Payment of Commercial Debts legislation enables you to charge interest and penalties for non-payment. That can be the nuclear option, however, and it's always best to try and settle late payment nicely first. Our illustrators have all experienced the ups and downs of freelancing. What hard-won advice would they pass on? "If you're only just going freelance, make sure you read up about how self-assessment works and make sure you understand about paying tax on account," Hunter advises. "Otherwise it can be a bit of a shock to find that you have to pay an extra chunk in the first year. And get used to saving every receipt in your wallet automatically from the start." Willa Gebbie agrees. "Even if it'll be some time before you start paying tax, you can offset the set-up cost of your business against future tax. That's a really useful opportunity to take." Keep your work money and play money separate, Walton counsels, recommending that you put a percentage of each payment into a separate account. "I think if all payments went straight into one account, hoping that by the time the tax bill comes around I'll still have the money to pay it is a risky strategy." We can say from painful experience that Walton isn't wrong. This article first appeared in Computer Arts, the global design magazine. Subscribe to Computer Arts here.